* Acts 14:22: Vulgata: “per multas tribulationes”. Experiencing this on himself, being endowed with many worldly honours and deprived of the same, this was noted by Miklós Bethlen, called by vain title a Count, in the 1711th year of the Lord's birth, the seventieth of his life, and the eighth of the captivity [imposed] by the Lord, in Vienna, on September 21. Count Miklós Bethlen of Bethlen was born on September 1, 1642 in Kisbún (Boiu) of Küküllő county, a son of János Bethlen (1613-1678), Chancellor and historian, and Borbála Váradi (?-1661). First he was educated by Pál Bíró of Keresztúr at home and in Gyulafehérvár (Alba Iulia), like his father had done, and then by János Apáczai Csere in the College of Kolozsvár (Cluj). In 1661 he went abroad, accompanied by his mentor, Pál Csernátoni. He studied in Heidelberg, Utrecht, and in 1663 in Leiden. In London and Paris he was also received by the Kings, and he also visited a number of other towns. He returned home in April of 1664. During his travel he spent some days in Csáktornya (èakovec) exactly when his host, the politician Count Miklós Zrínyi was killed by a wild boar. Later he spent several months in Venice. From 1667 he was Captain General of Udvarhely county. With the support of Mihály Teleki, he tried to establish connections between the Principality of Transylvania and the Hungarian plotters against Austria. In his writings published anonymously or with false printing place he made an effort to inform the European public about Counter-Reformation oppression in Hungary (Austriacae austeritatis continuatio, Venice [in fact Kolozsvár], 1672), and he also pleaded the case of the Protestant preachers condemned to galleys by Austrian power (Apologia ministrorum …, 1677; Moribunda Transylvania, 1687). During the the internal conflicts of Transylvania he was arrested in 1676 and imprisoned for a year in the castle of Fogaras (Fãgãraş), as partisan of Béldi Pál, Captain General of Háromszék county. In 1681 he fought as Sergeant General, and in 1682 as General in the counter-Austrian war of Imre Thököly. Later he was Captain General of Kővár, and in 1690 Lord Lieutenant of Máramaros county. After the battle of Zernyest (Zãrneşti) of August 21, 1690 – in which the rebellious Imre Thököly dealt a devastating blow on the united Austro-Transylvanian armies, the Austrian General Heissler fall in captivity, and Chancellor Teleki died – Bethlen became aware of the possibility to settle the position of Transylvania recently conquered by Austria. He presented his plans in Vienna, found powerful supporters to it, and he achieved that Emperor Leopold I issued the Diploma Leopoldinum in 1691 at the parliament of Fogaras. This patent guaranteed to Transylvania a certain political and governmental autonomy within the Hapsburg Empire, the freedom of the three political nations and four confessions, and the limitation of the burdens of taxes and military contributions. In 1691 György Bánffy was elected Governor of Transylvania. Bethlen, who only fall behind by six votes, became Chancellor. Bethlen was a Guardian of the Reformed Church of Transylvania as well as of the Colleges of Nagyenyed (Ajud) and Kolozsvár. He also supported the High School of Marosvásárhely (Târgu Mureş). He was the founder, together with his father, of the High School of Székelyudvarhely (Odorheiu Secuiesc). He achieved that the imperial court gave the Reformed Church and its schools the cameraticum beneficium, the funds that had been customary in the independent Transylvanian Principality. His authority was also recognized in Vienna. In 1696 Emperor Leopold I. granted him the title of Count and a present of 40 thousand golden forints of Rhine. Some years later the oppression of Transylvania has grown again. 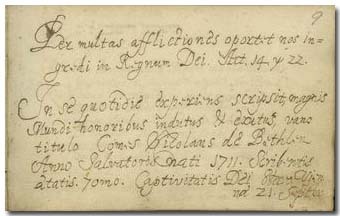 In 1704 Bethlen wrote an anonymous pamphlet with the title Columba Noe (Olaj ágat viselő Noe galambja …) that he intended to send to the ambassadors of the Netherlands and England in Vienna. However, this writing came to the hands of the imperial Captain General of Transylvania Rabutin, who had him arrested and proceeded against him for high treason. He spent four years in the prison of Nagyszeben (Sibiu), and in 1708 he was transported to Vienna. At the beginning of his captivity in Vienna he wrote a shorter Latin work on his own life and the reasons of the ruins of Transylvania entitled Sudores et cruces Nicolai comitis de Bethlen. Finally he was cleared of the accusation, but was set free only shortly before his death. He died in Vienna on October 17, 1716, six months after the death of his wife. He first married in 1668 with Ilona Kún (1652-1685), daughter of István Kún of Osdola (?-1690), Lord Lieutenant of Küküllő county. After the death of his first wife he married Júlia Rhédei (1669-1716), the orphan daughter of István Rhédei. Their daughter Júlia Bethlen (1686-1722) married Sándor Teleki (1679-1754) in 1703. Bethen began his chef-d'oeuvre, his renowned Autobiography in his transitory prison of Eszék (Osijek) in 1708, and finished it in 1710 in Bécs, principally for the edification of his wife and his son József (1698-1742). This work, a mirror of his own life, spirit and epoch, is an outstanding opus of the genre of memory. For a long time it was spread in manuscripts, then it was publised in 1858 by László Szalay, and then in 1943 by Gábor Tolnai. His Prayer book, written as an appendix to his autobiography, is an even more intimate confession about himself and his nation.